One of the first weekends this semester I haven’t been totally slammed with deadlines—a combination of both my writing classes having a “polish week” on the outlines of our projects (one is a screenplay, the other a spec script for a TV sitcom), and the holiday three day weekend—no classes Monday for President’s Day. I took yesterday off, and ran errands, watched recorded Battlestar Galactica and 30 Rock. I also spent some time on the internet researching literary journals, as it is far past time to do a new round of submissions. I was disappointed, however, to realize that almost all the non-fiction centered contests has postmark deadlines of February 15. I didn’t have time to put together cover letters and copies of everything before the post office closed, and although today is the actual deadline, it is a Sunday. Some of the journals had taken this into account, and extended to the 16th, probably not aware that this would also be a post office holiday. Oh well. It’s a good reminder to go get paper and toner and to try to at least find time to monitor deadlines. In the evening went to a “Goddess Evening” hosted by some people in the Wedenesday writers’ group I rarely get to attend because of classes. We did some chanting meditations and made prayer sticks, and ate potluck. There was talk of henna tattoos, but we never quite got around to it. Our host explained that a prayer stick is a Native American practice. 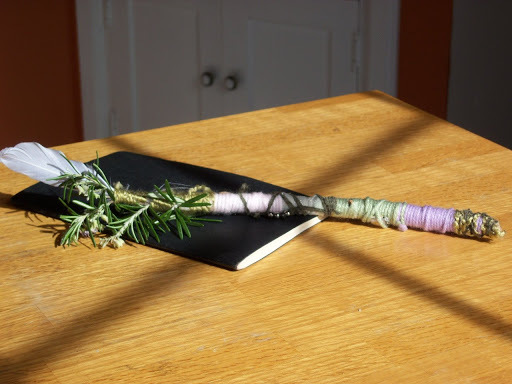 We made ours by writing manifestations, or prayers, on slips of paper, then attaching these to sticks. Then we wrapped the sticks, bottom to top, with yarn, ribbon, beads, etc. At the top of the stick is a feather, which is to take your prayer up to the gods. Because it was Valentines Day, and most of the attendees are currently single, the theme of the evening, was to attract the positive persons into our lives. But since I am lucky in this arena, I could dedicate my paryer stick to another purpose. And then, as I was wrapping the paper, I thought of one of those concrete things I had hoped for earlier in the day. On the back of my paper I added, “Publication,” hoping this could also apply to selling a screenplay. (Of course, I should have manifested “finishing a screenplay” first. And then, as I was starting my second color of yarn, I thought of something else. I wrote “baby,” on a second piece of paper, and attached it as well.